In my Build a Basic Toolkit series, it is now time to look at chisels. These tools are a very important addition to any toolkit, and a good selection of sizes and types will always get a great deal of use. Over the years, the number of different types of chisels developed for specific jobs has been enormous. These days there are fewer types available and, indeed, needed. But even so, your choice of chisels will depend on the jobs you intend to use them for. Here I look at the basic requirements for a toolkit... and then move on to cover some of the more exotic tools available. For your basic toolkit, a good set of bevel edge bench chisels is the basic requirement. In terms of sizes, starting off with a set including a 6, 13, 19, 25, 32 and a 38mm chisel will see you being able to tackle most jobs. 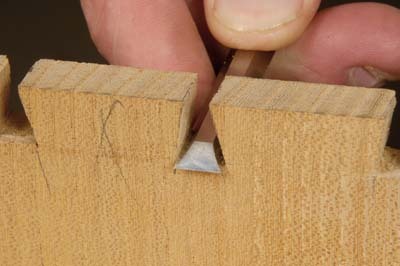 The chisels tend to have short blades for maximum control, and the bevel on the sides allow for maximum access to difficult to reach places, such as dovetails. 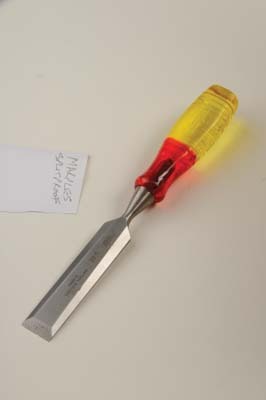 It is probably worth buying impact resistant resin composite handles, with or without a metal striking surface, if you intend to use your chisels a lot with a mallet. If you are buying wooden handled chisels, it's best to use chisels with strengthened handles so they don't split with repeated use of a hammer or mallet. Now to get started with a basic toolkit, you probably will only need a good set of bevel edge chisels, but as you expand your toolkit, you should think about getting some other equipment in, with slightly more specialised uses. 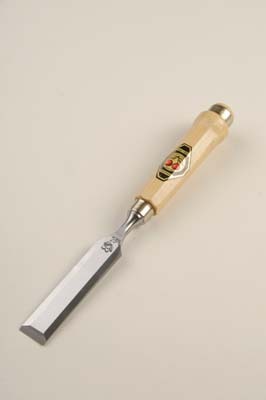 Firmer chisels are the oldest type of chisels. They have thick blades with the corners at 90°. They are used for general-purpose joinery and heavy material removal, and are strong enough for any job. They are particularly good for cutting joints where you want to maintain sharp 90° corners. The heavier sides help prevent undercutting preventing looser, poorer fitting joints. 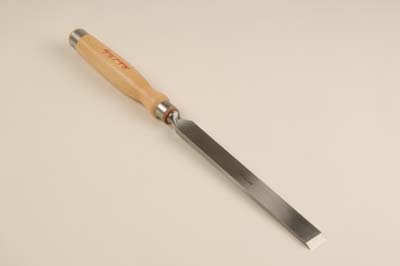 A mortise chisel is designed to do exactly what it says on the tin. It is used with a percussion instrument and is bashed into the wood and then levered out to remove waste. Normal chisels just don't have the thickness to withstand the levering out. 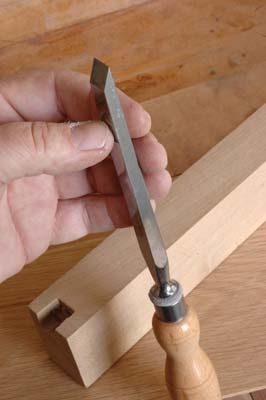 The bevel on a mortise chisel is also less acute an angle for the same reason. The chisels are also longer to aid in the levering out of waste material. 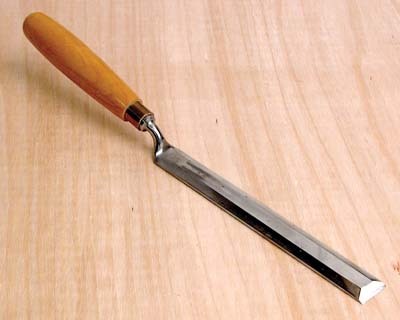 If you want to cut mortises with one of these chisels, then it is a satisfying pursuit. You can purchase them in a variety of widths to suit your thickness of tenon, but a chisel can also be used to cut a mortise that is wider than the chisel, so you don't have to buy every thickness of chisel for every mortise you would cut. 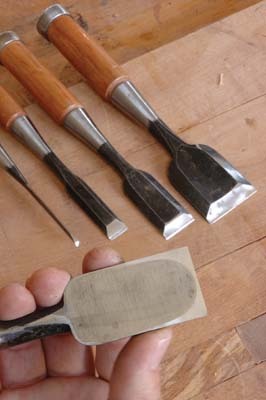 Sash mortise chisels are simply lighter versions of mortise chisels. They were designed for cutting the relatively shallow mortises found in the mullions and muntins of a wooden window. They are worth mentioning here, but not of much use unless you intend on doing lots of windows by hand. 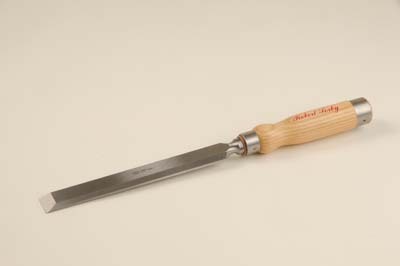 There is also a heavy-duty variant of the sash mortise chisel, obviously for slightly larger jobs. 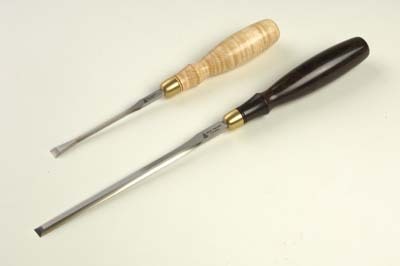 Paring chisels are long, thin and very light. They are used for shaving off thin amounts of wood when fitting joints, and should never be hit with a mallet - the blades themselves are thin enough to be almost flexible. They have a long length to give maximum control. One hand pushes the chisel with the handle while the other holds the blade and guides the cut. Again for a basic tool kit, these are not necessary, but they are very handy to have if you do a lot of joinery. There is also a fishtail paring chisel, with the shaft of the chisel being narrower than the blade, allowing paring in the most awkward places.Paring chisels also come in the 'cranked' variety: that is, the angle of the handle is offset against the line of the blade. This stops your hands fouling on the workpiece when pushing forward in a paring stroke. If you are planning on doing any boatbuilding or timber framing, then you'll need one or two of these monsters. 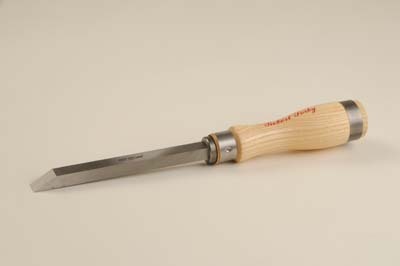 Often called a slick, this model by Robert Sorby has an offset blade to allow for clearance when working deep sockets and mortises, and is also used as a heavy-duty paring chisel which, thanks to its cranked neck, can work along any length of timber. This beast has a 60mm (23/8in) blade and it's overall length is 690mm (273/16in). What a whopper! We now come to the more exotic types of chisel. These specialist and very high end tools are not really for a starter's toolkit, but are worth knowing about if you develop your woodworking skills in a particular direction. This corner chisel is popular with cabinet makers. The one pictured is a heavy-duty version. It is used for cleaning up deep corners of mortices or other grooves. Each face is sharpened individually using an oil stone. 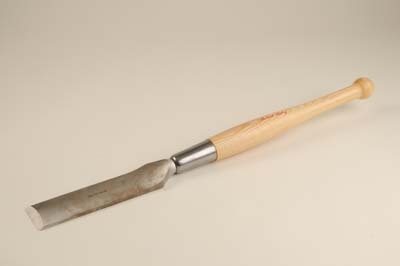 Japanese chisels were all the rage a few years back, though they seem to be not quite as popular these days. They are of a similar size to Western chisels, though often slightly thicker. There are two main differences, however. They have hollow backs to make progress through timber that little bit easier, and they are made of laminated steel, with an especially hardened steel along the cutting edge. This makes for a very flexible, and very sharp tool which keeps its edge. They also then need hooped wooden handles to resist malleting. 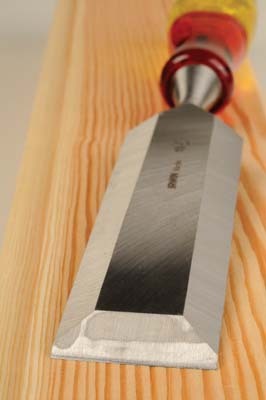 A special dovetail chisel was introduced for Western woodworkers which is triangular in section and has narrower edges then any Western chisel.